I'm using Visual Studio 2005 on a Windows 7 machine with WinSCP v5.7.7. I'm trying to use the .Net Assembly in an SSIS Script using VB .Net as the scripting language. When I am editing the script, I click on Project/Add Reference but there is no reference available in the .NET tab to WinSCP. There is also no "Browse" option to manually select the DLL. I have added it to the GAC as per instructions on the WinSCP site and have trying using both GACUTIL and the ".NET Framework 2.0 Configuration" tool (Start\All Programs\Administrative Tool\.NET Framework 2.0 Configuration". I have tried adding a key containing the path to the WinSCP folder where the WinSCPnet.dll is installed (C:\Program File\WinSCP\) to the registry key for .Net Assemblies namely HKEY_LOCAL_MACHINE\SOFTWARE\Microsoft\.NETFramework\AssemblyFolders. I have also tried a few other keys as recommended by various posts on the web, but none made any difference. 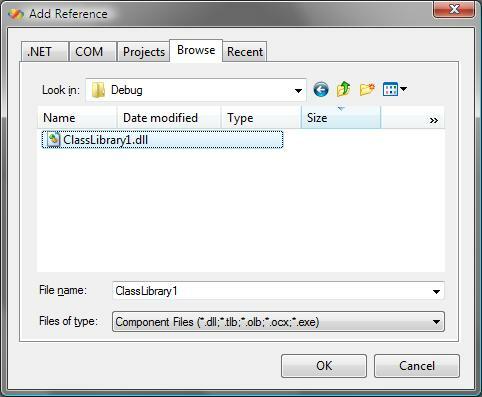 In each case, the reference does not appear in Add Reference window in VS2005. It does however appear when I tried to add a reference to a VBA project (Access or Excel) but that is different. I'm sure if I could fix this one issue, I could utilise it, but I just cant seem to find a resolution. Yes I'd read that too, but as per my OP, I don't have a browse tab. I only have the .Net tab. Perhaps this is something unique when editing an SSIS Script Task? Next step is to try and deploy the finished solution to a production machine.